From McKenzie Junction, the canyon narrows for a few miles. All along the way are log cabins: all types from big fancy log cabin kit homes to antique Lincoln Log designs with frame additions to homestead cabins that have comletely fallen apart to others that have been extensively refurbed. There's a lot of water in the creek along here but not much for big views until you top out at Hosa Flats. Right there the country opens up and you are on top of the spine of the Wet Mountains: the view west is spectacular. The road winds back and forth as it descends into the Wet Mountain Valley and offers tantalizing views to the west and northwest. Then you arrive in Silver Cliff. Once upon a time, Silver Cliff was a major silver mining town full of saloons, casinos and dance halls with mining and partying going on 24 hours a day. After 10 years the mines began to peter out and cattle ranching settled in. Today, Silver Cliff is a quiet and peaceful place with almost no mining going on and eight Centennial Farms still in operation (a Centennial Farm is a farm owned and operated by the same family for more than 100 years) in the county. Westcliffe came into existence because the Denver & Rio Grande Railroad built their tracks up through Grape Creek Canyon to one mile west of Silver Cliff, and then they built their town. This was a favorite tactic of the railroad builders because it gave them a complete new townsite to sell off to those who would do business with the railroad. And it completely devalued the townsite they were building close to. 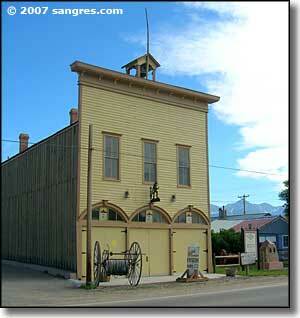 This is how Westcliffe came to be the county seat and the largest town in the county. 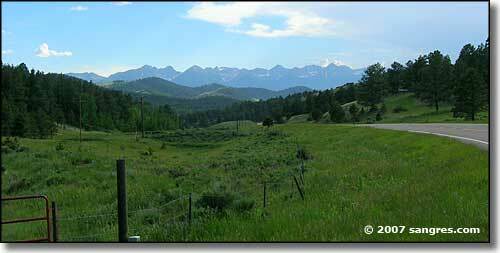 At the intersection of State Highways 96 and 69 in Westcliffe, the Frontier Pathways Scenic and Historic Byway meets up with its' leg that heads from Westcliffe to Gardner. 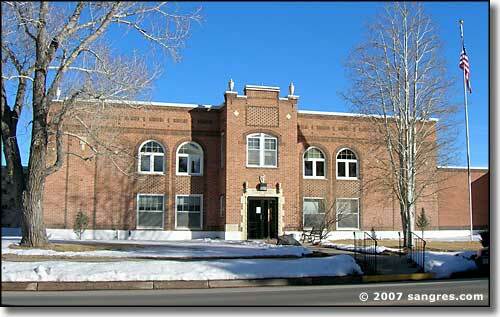 Just south of that intersection is the Custer County Courthouse, built in 1929.